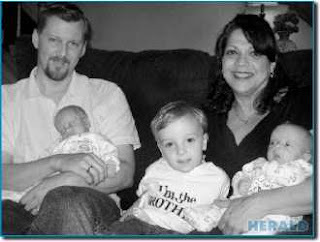 July 02, 2009 - Even at 53 years old, Valley Stream resident Sarajean Grainson had a biological clock that never stopped ticking. And now, six weeks after the birth of her twin sons, she wants women to know it's never too late to be a mom. After speaking to a 40-year-old friend who underwent in-vitro fertilization, Sarajean decided the procedure was the best choice for her. To increase the chances of a pregnancy, she was implanted with two donor eggs from East Coast Fertility, a clinic in Plainview, in April 2006, and gave birth to a son, Luke, the following December. She and David went back to East Coast Fertility in September 2008, hoping to give Luke a younger sibling. This time three donor eggs were implanted, and two of them turned out to be viable. The Grainsons were told they were having twins. I was in shock, Sarajean said. I was hysterical crying. -- True IVF stories and inspiration from the women who have been there. In-vitro fertilization is not a journey you need to take alone.